In the days before rail service was consolidated under Amtrak, different lines were run by different companies, often using different stations. The Grand Trunk Western Railroad line passed through Detroit (not to be confused with Michigan Central), and its station was located on the Detroit River at Brush and Atwater, near where the Ren Cen is now. Railroad lines used to operate a separate ticket office in the business district, and the Grand Trunk operated it rather close to the station—first, at Woodward and Jefferson (where One Woodward Avenue, formerly known as the Michigan Consolidated Gas Company building, a Minoru Yamasaki design, now stands); and then at 612 Woodward Avenue in the Traub Brothers Jewelry building. Currently, that building, and an adjoining one, houses the Grand Trunk Pub, formerly known as Foran’s Irish Pub. 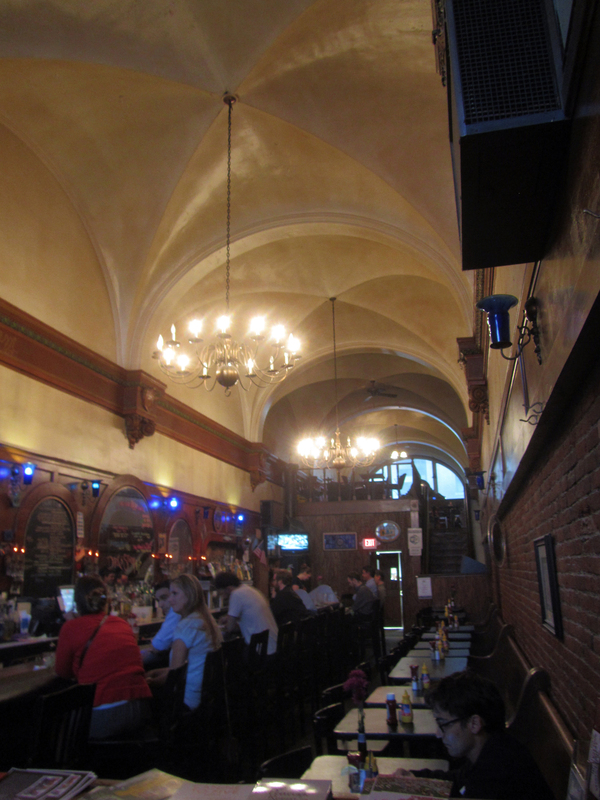 The pub has plenty of atmosphere. Its owners have done some restoration, with sensitivity to the building’s history and an interest in the railway theme. 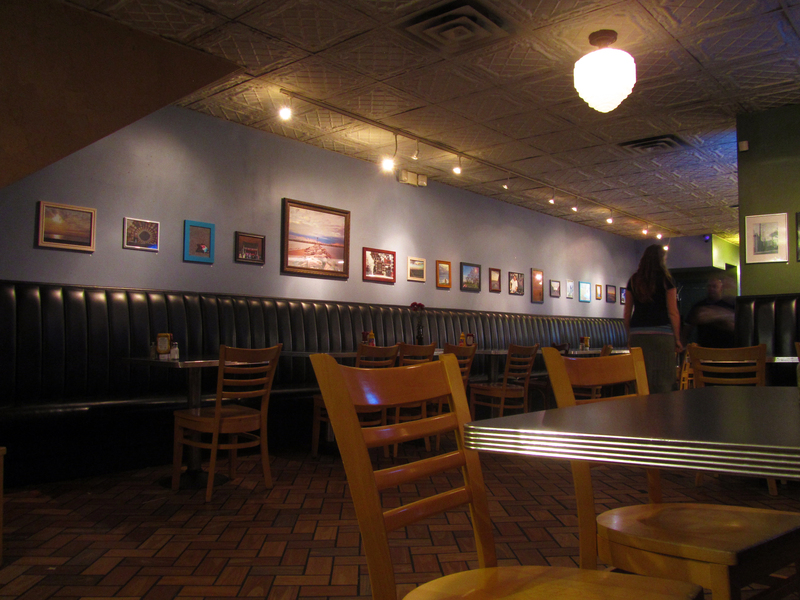 The restaurant side is a little hole-in-the wall spot, but the good kind. “Gourmet pub grub” is what the menu says. 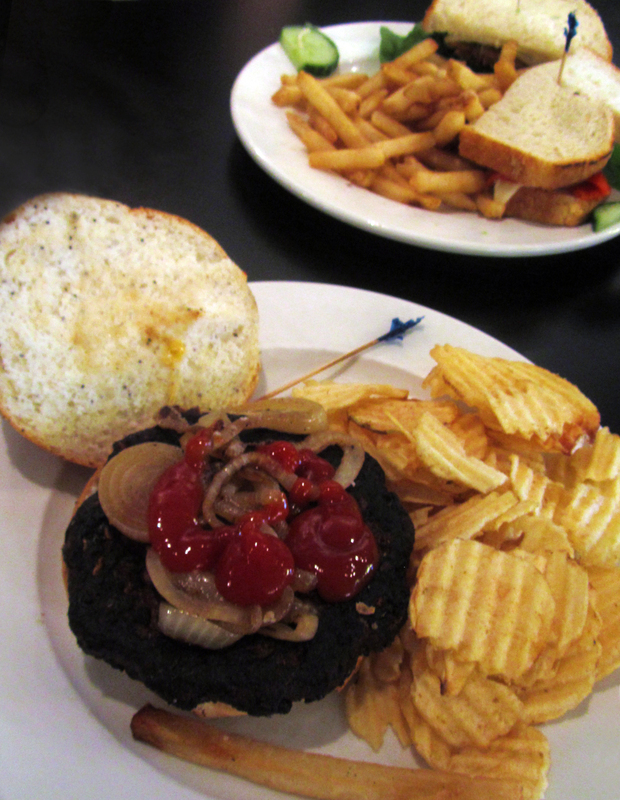 Foreground: Veggie burger with grilled onions and a side of Better Made chips (and one fry stolen from the other plate). Background: A shaved turkey sandwich with a side of fries. One of my favorite things about their menu is that they source much of the food locally, and include Detroit classics and favorites, such as Better Made potato chips as a side, Faygo to drink, or Sanders Hot Fudge on the “Michigan Mud Pie.” The prices are also quite good. As a vegetarian, I often don’t have a lot of options in this sort of place, where the fare is primarily sandwiches and burgers. 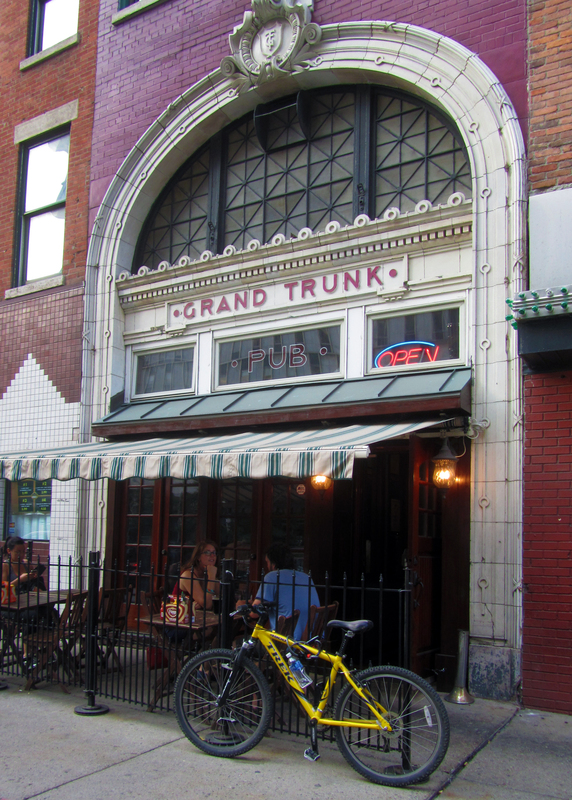 However, the Grand Trunk Pub has a unique approach: you can substitute a veggie burger patty on most of their specialty burgers, or you can have a basic veggie burger with the toppings you prefer. This is a snapshot from the menu on their site. Click on it to visit their online menu. 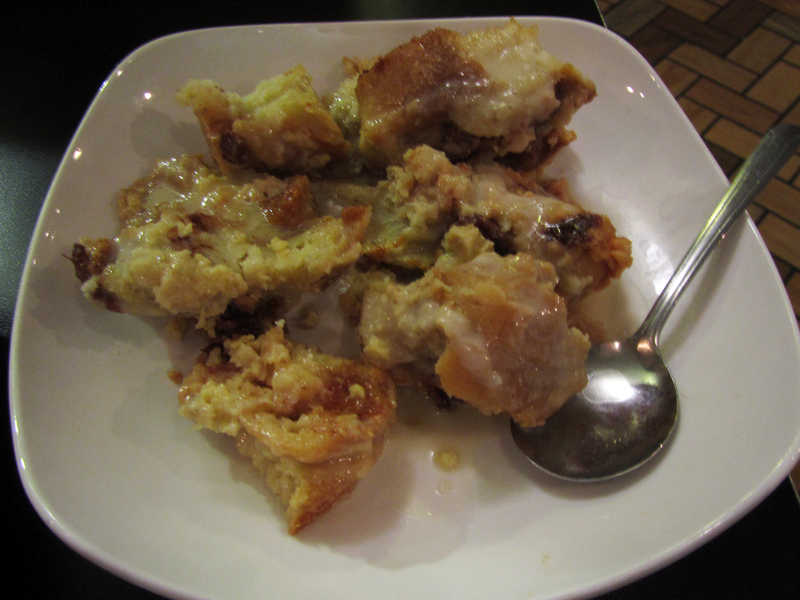 For dessert, the bread pudding with whiskey caramel sauce is pretty good (especially for $4.25! 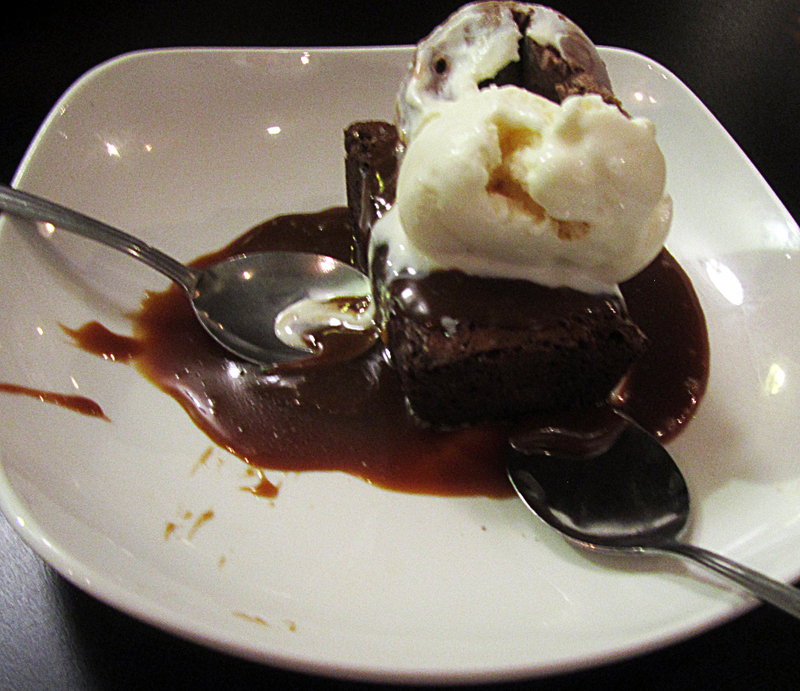 ), but I prefer the Michigan Mud Pie (just $5). Pro tip: We ate dinner at the Grand Trunk Pub, then went over to the Riverwalk for a while, walked around there (as you do), and returned to the Grand Trunk for dessert! Michigan Mud Pie, shown here with a scoop each of vanilla and chocolate ice cream. We were given a choice. Bread pudding with whiskey caramel sauce. 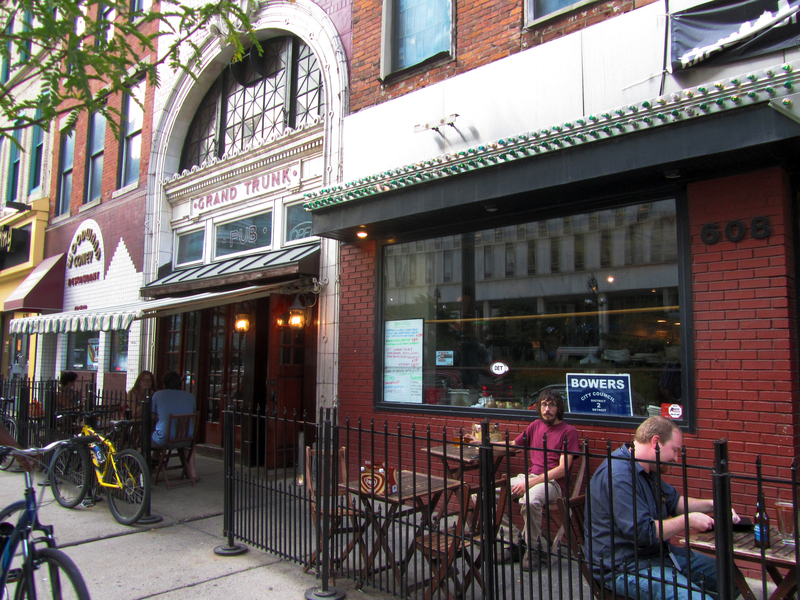 This entry was posted in Detroit, Food & Drink in Detroit and tagged Better Made chips, bread pudding, Detroit, Detroit history, Downtown Detroit, Grand Trunk Pub, Grand Trunk Western Railroad, mud pie, Veggie burger. Bookmark the permalink.